Want to blow your friends away at your next dinner party? Try these moringa and mushroom fried rice balls! The best part is that you can make them in advance, freeze them, and just fry them up right before your guests arrive. Our partners at Griffith Foods and the genius’s chefs on their global culinary team created this recipe for us. 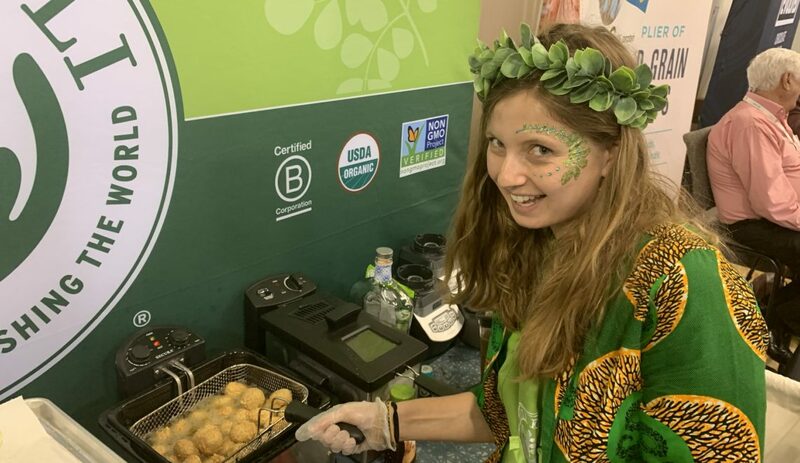 We shared these yummy bites at the Natural Foods Expo West in Anaheim earlier this month. Heat ¼ cup oil in a large frying pan. When sizzling, add the mushrooms. Fry until golden then remove and let cool. Heat remaining oil in a frying pan and add onions to caramelize. Place rice in the frying pan and toast over medium heat for 2 minutes. Remove rice from heat and add moringa powder. Let chill for 1 hour. Next, assemble the arancini by stirring together the mushrooms and mozzarella into the rice. Form into balls (about 20 grams each). At this point, you can freeze balls to use at a later date or continue with steps 7 and 8. Crack eggs into a bowl, beat with a fork, then put the breadcrumbs in a separate bowl. If you have a deep fryer, heat to 350 degrees F. If you do not have a deep fryer, check out this article to find out how to do without. Dip the balls in the eggs, then roll in breadcrumbs. Fry in the oil, 4-5 at a time, until golden and crisp. Enjoy while warm, alone or with Peri-Peri sauce! We would love to see how you enjoy these tasty treats! When posting on social media, please tag us @KuliKuliFoods and hashtag #MoringaInspired and #KuliKuli.